Whether you’ve always wanted to paint a landscape or haven’t tried to in a long time, build a solid foundation for studio-based watercolor through instructor demos and guided practice painting landscapes from photo reference. Carefully designed projects help you learn the basics of seeing shapes and values, painting with a three-layer, four-value approach to help you gain confidence in vibrant color mixing, lively brush work and dynamic composition. Materials list available in store or after registration. Saint Paul teaching artist Tara Sweeney has been creating award-winning watercolors for nearly forty years. She holds signature status in the MN Watercolor Society and National Watercolor Society. “Close to Home: Sketching a Minnesota Year,” is her debut collection of illustrated creative nonfiction. She was awarded a 2017 MN state arts board artist initiative grant to illustrate the picture book A to Zåäö, as artist-in-residence at the American Swedish Institute (University of MN Press publication, spring 2019.) 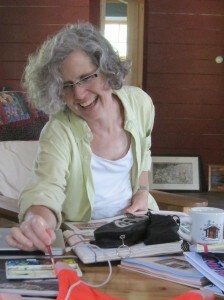 She taught drawing and painting at Augsburg College for 25 years. She holds degrees in design and studio art from the University of WI and an MFA from MCAD.